Good cable management is essential to keep the fiber cables in acceptable condition and ensuring transmission performance with high-density cabling. A 1U detachable horizontal patch panel is an amazing part in cable management due to its multiple choices for application. This article will introduce the structure of a 1U detachable horizontal cable management patch panel and its diverse applications in network installation. 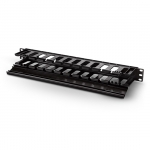 This 1U detachable horizontal cable management panel consists of four parts that are held together by screws and can be removed by tools. They are illustrated in the following figure, including horizontal laser bar, horizontal laser panel, D-rings and 1U patch panel. 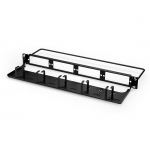 This 1U detachable horizontal cable management patch panel can be used to manage cables for different active or passive network devices because they can be assembled randomly to meet your needs. 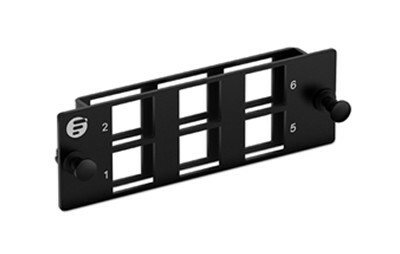 Here are four application examples of this detachable cable management patch panel. It is a good choice for holding different types of adapter patch panels. 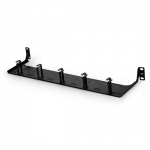 As a whole, this detachable cable management patch panel can be used with LC adapter panel. Here it is used with four fiber adapter panels with 12 LC duplex single-mode adapters. Besides, taking off part 4, it can also be used with a 12/24-port adapter in 1U patch panel form. Combining part 2, 3 and 4 mentioned above, it can be used with MTP/MPO adapter panel. Here it is used for four 8 MTP adapter panel. It should be noted that for each MTP/MPO adapter, 8-fiber MTP/MPO connector is also suited to be linked with 12-fiber MTP/MPO connector when only 8 fibers are used in the 12-fiber MTP/MPO (such as in 40G network). 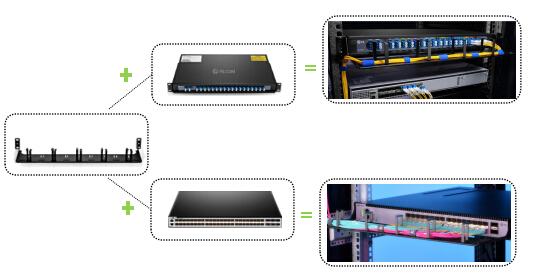 By using only part 2 and part 3, cable management for a 1U rack mount fiber enclosure is perfectly achieved. The combination in the last example can also be used to manage cables coming from 1U WDM Mux/Demux or switch. 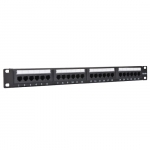 In the following figure, on the top this detachable patch panel is used with a 18 channels CWDM Mux/Demux and at the bottom it is used with a switch. 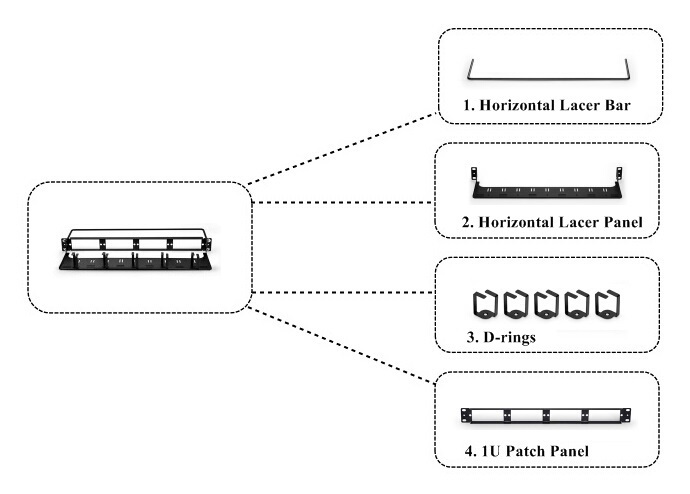 From the application examples presented above, we can see that this 1U detachable horizontal cable management patch panel is very capable in different cabling situations. You may notice that cable ties are also used to help organize the cables placing inside the D-rings. If you interested in this multifunctional assembly, you can find it on our site (FS.COM). You can also find many other helpful cable management assemblies for managing efficiently high-density structured cabling in your data centers and telecommunication rooms. The following table displays some details of several cable management devices provided by us They are all in stock at Seattle warehouse and are available for same-day shipping.